Here it is, the brand new E-Class in all its glory. As you can see, the biggest change is that Mercedes-Benz's most important model will switch from the dual-pod lights seen on the current one to single units with LED wizardry. I guess that's how Stuttgart says "hi" to Ingolstadt. The rest is even less shocking, with the new car looking like a small S-Class from the side with its dynamic lines, and with a rather boring back as far as the sedan goes. 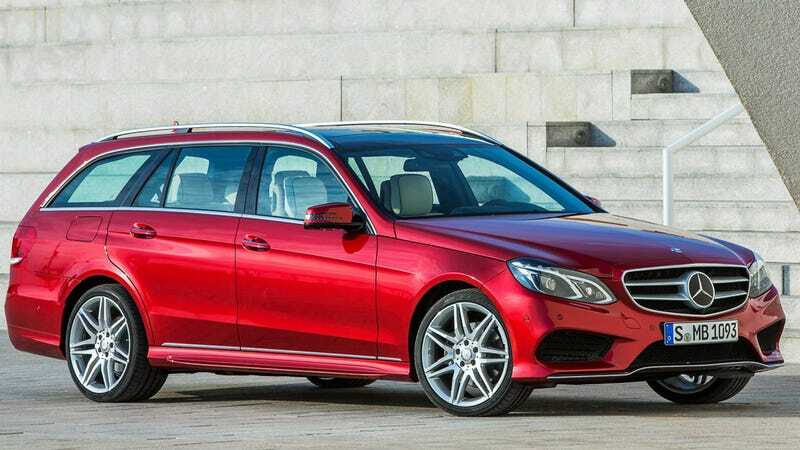 But this is the E-Class, not an Aventador, so conservative styling is something their customers demand. The fans of the star in the front will get a traditional one on the sedan, and the giant black version on the grill of the estate. These photos are out a few days in advance of what Mercedes planned so we don't have much information but here's a good guess: there will be V6 and V8 options on both sides, including turbocharged and hybrid variants, and a possible AMG bi-turbo as well. As you would expect, a seven-speed automatic and the active suspension will make sure you're having a smooth ride while sitting in your leather chair.